Once the tide turned, it was only a matter of time until the fish started popping. Or so we thought. It was running slowly for about 40 minutes, then someone threw a switch and it started to scream out. There was a ton of bait, but no signs of the Stripers we were after. Then I hooked up. First fish of the night was a fat little 20″er. Quickly released. Caught on a Berkley Jerk Shad. After that we had a series of hit and misses. It was really hard to stay in touch with your lure in the heavy current. I hooked up again and my line snapped while battling the fish and current. Rich had a fish come unbuttoned during a nice fight. Then, right about when we were going to call it quits, Rich hooked up again. 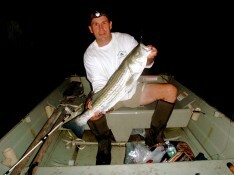 The Striper was giving Rich and his rod one helluva fight, but Rich finally prevailed and landed a nice 29″er. Caught on a Tsunami Eel. The tail looked a bit suspect, blotchy and red, and the stripes were missing. Micobacteriosis maybe? Anyway, the Bass was released. We had a few more bumps each, but it was getting harder to keep your line tight with the current, so we called it a night. Had a blast!